Exactly one year after their children perished in the Mumbai terror attacks, Rabbi Nachman and Freida Holtzberg of New York and Rabbi Shimon Rosenberg of Afula, Israel, will participate in a memorial ceremony at the Nariman House, the heavily-damaged structure that once housed the city’s Chabad-Lubavitch center. Taking place alongside memorial events elsewhere in the Indian financial capital, the Nov. 26 ceremony will recall the sacrifice of Rabbi Gavriel and Rivka Holtzberg, who perished with four of their Jewish guests when terrorists stormed the Nariman House. Beginning at 9 a.m. Eastern Time, members of the public can view a live simulcast of the proceedings at www.Chabad.org/Live. The agenda for the ceremony includes addresses by Rabbis Yehuda Krinsky and Moshe Kotlarsky of Lubavitch World Headquarters; Avraham Berkowitz, director of the Chabad Mumbai Relief Fund; Yosef Kantor, regional director of Chabad of India; Dr. Shashi Tharoor, Indian Minister of State for External Affairs; Israeli Ambassador Mark Sofer; Israeli Consul General Orna Sagiv; and Mumbai Mayor Subha Raul. Chasidic singer Benny Friedman will lead a vocal tribute to all of the victims in the Mumbai attacks. 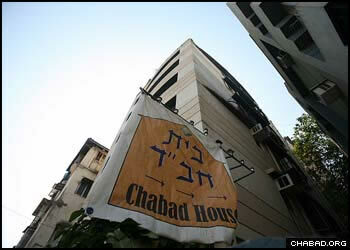 To donate to the Chabad of Mumbai Relief Fund, click here.